Four of Cups Tarot Card Meaning - All Explained HERE! The Four of Cups is the fourth card in the Cups suit. The image shows a man sitting under a tree, intently looking at three cups. 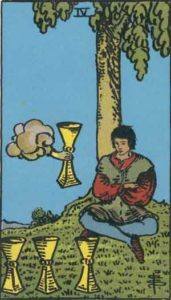 An arm protruding from a cloud is offering him a fourth card, which he is either ignoring on purpose or just cannot see. Not a wholly positive card, but not bad either, the Four of Cups can represent a mind that is sometimes so focused that it misses the bigger picture. The Four of Cups represents self reflection, meditation and contemplation. Past – The Four of Cups in the Past position can mean that you are recovering from something that happened in the past that you didn’t like. Think to some event that didn’t play out how you wanted it. Are you still thinking about it? how long has it been now? Time heals all wounds but don’t feel like you have to pretend to be happy when you aren’t. Did you miss something that you should have seen? Analyse the past as a bigger picture. Present – The Four of Cups in the present position means that you should start thinking outside the constraints that you have set on yourself. You might have been hurt in the past, but you don’t want that to continue on for much longer. We all need time to get over things so don’t rush yourself. But be aware that it’s up to you to try to help yourself and see from a different and new perspective. Again, there may be something you’re missing, so try to see the bigger picture of what is going on. Try to explore all avenues. Future – The Four of Cups in the future position can mean that there will be a period in the future that you’re going to have to stop, sit down and think about. Not necessarily a tough decision, but just something that you’re going to need to contemplate to understand. Consider your choices in the near future, which ones are better or worse for you? Are you going with your heart or your head? It can take some time to get on the right path. Work / Education – The Four of Cups in regards to work or education can mean that work isn’t going too well. This isn’t your ideal job, or this isn’t want you want to be doing right now, is it? The same with education. Power through if you can, and don’t ignore the help that is being offered to you. You may have skills that can be put to better use somewhere else, possibly another job that is crying out for you. Romance – The Four of Cups in romance can mean a few things. Make sure nothing is hidden. Has something happened recently that you’re thinking about? You might not be seeing the full picture, there could be a key thing missing. If you’re single and looking for someone; it could mean that there’s just one little thing wrong about how you’re presenting yourself. Ask others for advice, try not to cut anyone out, and contemplate from all angles. Friends – The Four of Cups in regards to friendship means that now is a time to think about your friends and how you act around them. Are you really friends with these people? Have you ignored someone in the past? Is there some sort of gossip or drama happening that you don’t fully understand? You might need to ask around to get a clearer picture. It might be time to stop concentrating on your core group and grow your friendship circle. Money – The Four of Cups in regards to finances is a mixed sign. There could be great wealth that you’re missing out because you’re either being stubborn, or you just don’t understand the concept yet. Focus on what you can do and what you’re doing now. Combine your skills. You need to work your way out of this. Health – The Four of Cups suggests you should pay attention to your body and what it is telling you. Don’t ignore any pains if they are lasting. Again, importantly, don’t neglect your diet. You might be neglecting to eat a certain important aspect of what you should be taking in. There might be a tendency to just forget about something that is bothering you, but deal with it directly, if you can. Spirituality and Mentality – The Four of Cups in spirituality beings out the contemplative and meditative aspects of the card. You can;t solve all your problems by thinking about them, but you can think about them to understand them and learn from them. Your mind is your own personal playground with no limits. Remember to keep positive, but if bad thoughts come into your head, do not ignore or censor them. Think about them harder. In reverse, the Four of Cups can show some better aspects of this card. You may just be about to see the bigger picture in life, although you’re currently clouded. In life, look for things that are distracting you from your true goals.It’s possible you could be doing a lot better for yourself if you took a step back. Four represents the structure and foundation. Four, like three, can be very grounded in reality All fours symbolise this. The Four of Cups strongly represents that you’re thinking about where your life is heading. You want to plan well and live the best life possible. Remember not to spend all your time planing, you have to actually do things to! If you have many fours in a reading, it is a strong indication that you’ve planned well and now you’re reaping the rewards. As a Yes or No question: Unclear, but is it a question that you really want a definite answer for right now? We’ve selected live tarot readers to give you a FREE 3 Minute interpretation of The Four of Cups! Scroll through them below and pick your favorite one.